Tamales are so good! Its fun to get them at farmers market’s and Taco Stands, but what could be better than making them yourself? It may seem like a long and daunting process, but I have a few tips and tricks to help out, and the reward is worth the price :) I did post this recipe before, but I have updated and improved the recipe. I used Chicken Tinga for the filling this time, and the result was so much more flavorful! Here is the newer and best version! Serve with Spanish Rice and Homemade Hot Sauce. Heat the oil over medium-high heat, in a large pot. When the oil is hot add the onions and saute until transparent. Combine the water, crushed tomatoes and chipotle peppers in a blender, and blend until smooth. Pour the tomato mixture into the pot with the onions (once they are transparent) and let it come to a simmer. Reduce the heat to medium, then add the shredded chicken, and stir until it is coated. Cover the pot and let it simmer, stirring occasionally, for 20 minutes. This is where I put the chicken in an airtight container and stored it in my fridge until the day I was making Tamales. Do this the day that you plan to make the tamales. Boil enough water to cover the corn husks. Pour water over corn husks and submerge the husks completely. Let them soak while you prepare the masa. They should be soft and pliable by the time you want to use them. You can prepare the masa by hand, or with a bread mixer. If you use a mixer it will go a lot faster and you won’t get so tired. Combine masa flour, salt and baking powder in the mixer on a low setting. Add chicken broth and continue to mix until smooth. Add the lard and mix until smooth. You may need to add more lard on the consistency. You want it to be somewhere between the texture of peanut butter and the texture of play dough. If it is too sticky you will have a hard time handling it. If it is too dry it will not be good. Mix and adjust lard/masa/broth until desired consistency is achieved and ingredients are well mixed. This is the fun part! Assembling everything into tasty little packages! The amount of masa you use for the tamale depends on the size of each corn husk. Use enough masa to cover maybe 80% of the husk, and make it about the thickness of 1-2 quarters, give or take a little bit. As you pat the masa into the husk, it helps if you have a glass of water near by to wet your fingers, so that the dough doesn’t stick to you. I did mine so that the masa was close to one edge of the husk and left extra husk on the other side so that it could overlap the seam when I rolled the tamales. Now it’s time to add the chicken tinga (no need to reheat it – it will heat up as you steam the tamales). Tamales use a lot less meat than you would expect them to. Mine took about 2-3 TBS per tamale, and just spread it down the center of the masa. As you roll the tamale, the masa and filling should be thick enough that the edge you roll meets the opposing edge of the masa without wrapping the husk in the tamale too much. If this does happen, just slip the husk off the masa as you roll, so that you wont get bits of husk in your tamale when you eat it. Fill and roll all of your tamales. This is the part where most people use a steamer. I didn’t have a steamer, however, so I got creative. I put a metal strainer over a boiling pot of water, and put my tamales in a metal can over the strainer. Update: I now have a vegetable steamer, which worked great to put in the bottom of a large stock pot, with the tamales standing on top. Do whatever you need to do so that the steam gets to the tamales and the water doesn’t. Something should be covering the tamales (i.e. a lid, or a metal can if necessary) so that the steam can’t escape too much. The tamales steam best if they are standing on end, because some of the lard in the masa will drip out. If they are stacked laying down, the bottom tamales will get soggy, and the top tamales won’t cook as well. Also be careful not to pack the tamales too tightly in the steamer. Give them a little room to breathe. Put the steamer over medium-high heat, and steam the tamales for 40-60 minutes (depending on the size of your pot), or until the masa becomes firm, like a tamale. Be careful not to let the pot boil dry. You can add water as needed. Serve hot, with Spanish Rice and Homemade Hot Sauce. 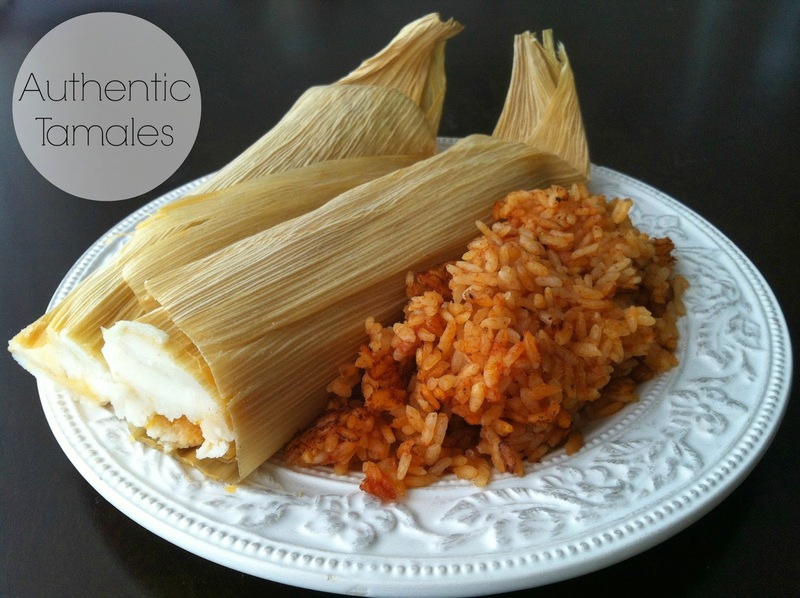 Store remaining tamales in an airtight container in the fridge, or freezer.